The SPT6 Suppository Penetration Tester is used to determine the softening time of 6 samples at the same time. It is made in strict compliance with the monograph of the EP Apparatus A. The Apparatus needs to be placed into a suitable Plexiglas water bath. 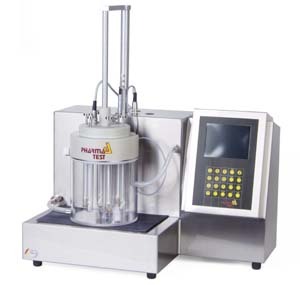 It is possible to use the SPT6 in a Pharma Test Tablet Disintegration Tester of the type series PTZS, DIST3 or PTZ AUTO. Using it within the PTZ AUTOEZ instruments the softenting time can be detected automatically.